Today's guest blog comes from Westmont Montessori School in Victoria, BC. 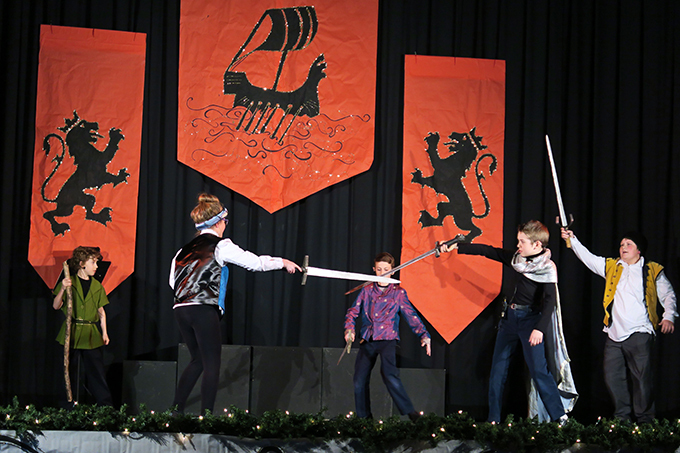 Supported by an Artists in the Classroom grant, Elementary students worked with professional artists to tackle Shakespeare's Twelfth Night, learning a great deal about language, literature, theatre — and having fun along the way. 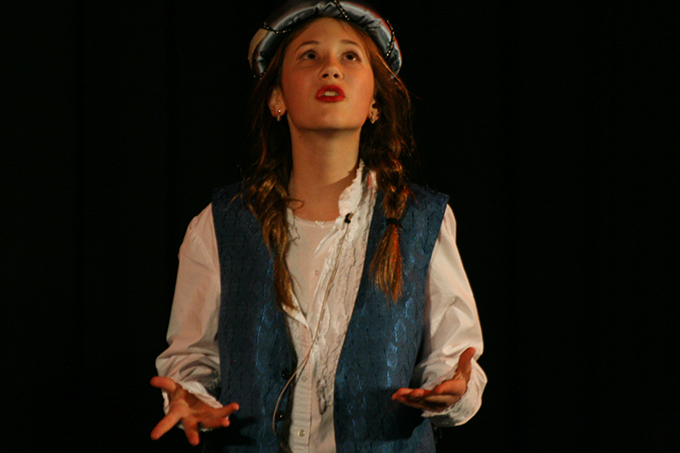 On the 400th anniversary of Shakespeare's death Westmont School celebrated the bard's life and works with a production of Twelfth Night, a comedic tale of mistaken identity, misplaced love and mischievous deeds, but also containing some of Shakespeare's most beautiful poetry. Working from the original text, students decoded the complexities of Shakespeare's words and engaged with the evolution and plasticity of language. Our work began in November with our Grade 4-6 teachers conducting an in-class novel study of this challenging work, developing an understanding of the plot and the characters. Students studied literary terms such as comedy, tragedy, iambic pentameter, simile, metaphor, hyperbole, oxymoron, alliteration and personification. 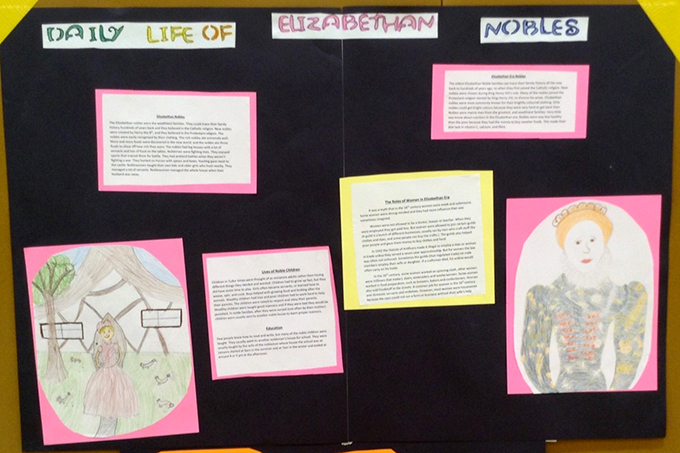 In addition, students participated in an in-depth study of Elizabethan England, creating posters exploring themes such as military technology, belief systems, and ways of life in the 17th century. Through ArtStarts' generous Artists in the Classroom funding we were able to bring some serious professional talent to the table: instruction and direction from theatre artist and director, Trent Arterberry; University of Victoria Instructor, Phil Duchene (Education and Theatre); and award-winning choreographer Kathy Lang. Students worked with Trent and/or Phil two hours per day for five weeks. Week one involved reading and casting the play. Weeks two to four covered blocking and rehearsing the scenes. Phil led the students in a stage combat workshop to help them develop and choreograph their play-fighting skills. 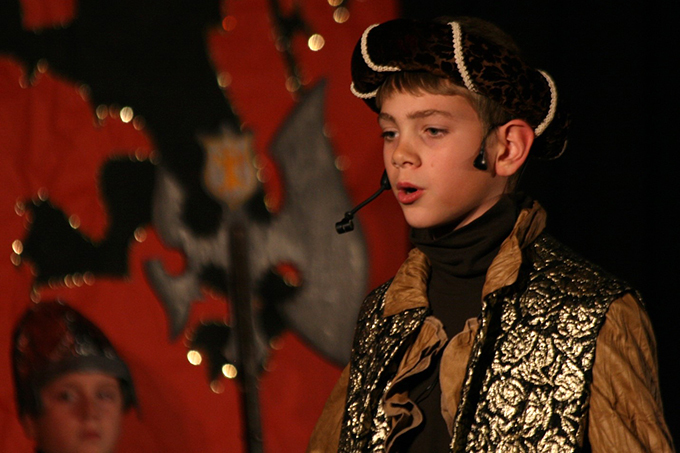 In addition to editing and directing the play, Trent choreographed a mimed shipwreck scene for 22 Grade 4 students. Week five put it all together with production, adding microphones, live music and lighting. Even shortened to 10,000 words, it is a big play and an ambitious project for ten- and eleven-year-olds. The finished product ran just over an hour. We wanted to get the entire Westmont Montessori community involved. 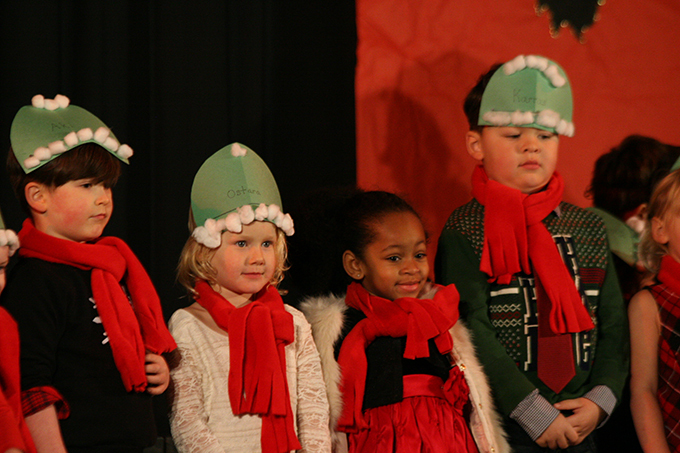 Staff and parents provided live music as well as costuming. Our music teacher directed choral works and assisted the choreographer. Our grade seven and eight students created amazing props and stage settings with our art teacher. Our winter celebration committee decorated the stage and auditorium. And then, of course, the performance itself. 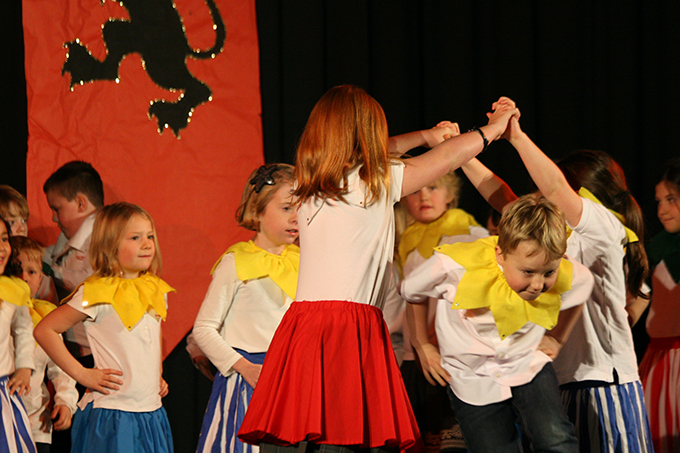 Our Grade 1-3 students danced their socks off to a Minuet and a Morris dance choreographed by Kathy Lang. Our Grade 4 students mimed the fateful shipwreck scene, and sang a heartfelt hymn at the end. Our Grade 5 and 6 students put their hearts into this Shakespearian tale with all its twists and turns, laughter and surprises. The result was nothing short of outstanding as these young students conquered the memorization of copious lines of Elizabethan English, while also demonstrating that they clearly understood the story, and even the character motivation, throughout the show. 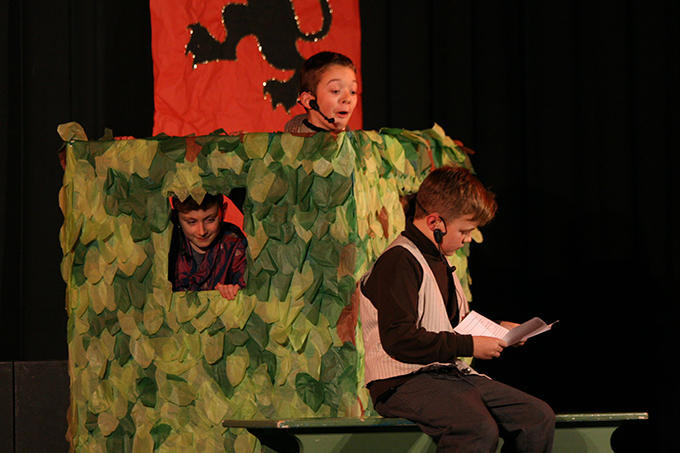 Through performance, the students experienced the joy of bringing a text to life, working together to create a unique piece of art and developing skills in both verbal and non-verbal communication. The sense of accomplishment afterwards was felt by all involved; 9 to 12 year olds are truly capable of comprehending and performing Shakespeare! Our entire community will remember this production of Twelfth Night for years to come.